Terry Nelson may not be a name known by the general public, but he is regarded as a career lifesaver in the hallowed halls of Manchester United, Arsenal, Tottenham Hotspur, Crystal Palace, Manchester City, Aston Villa and the England national squad. The man behind the award-winning Aqua Running suit, which allows injured athletes to train and rehabilitate in the water, launched last week in the United States with the help of Media House International. At a reception at the British Deputy Ambassador’s Residence in Washington, D.C., Nelson announced his intention to work with 50 US military veterans as his frontline trainers across the country. Founder Nelson is known as a “secret weapon” within European football – his Aqua Running suit is so in demand that Real Madrid reportedly refer to it as their “fourth kit”. A former football player himself, Nelson left Liverpool’s Under-18 squad to join the British Army’s Parachute Regiment before tragically losing a leg due to kidney failure and two kidney transplants. 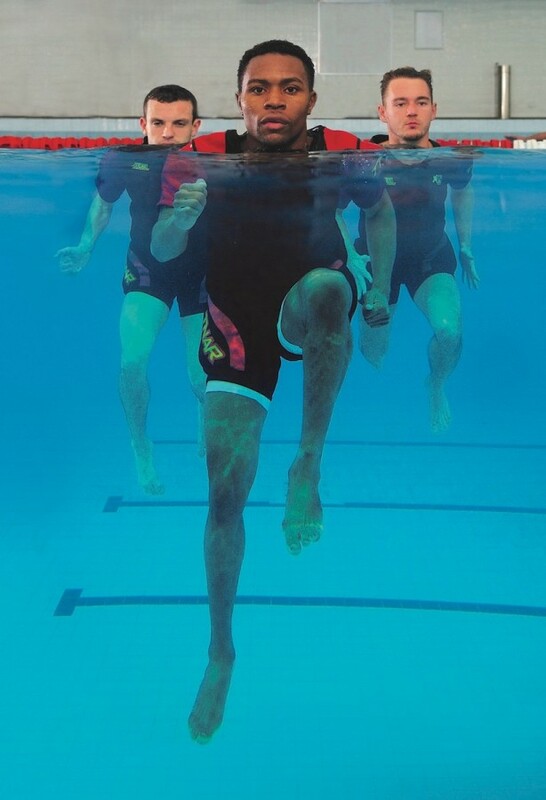 Determined to retain his fitness throughout his illness, Nelson began training in water to ease the pressure on his body and enable his recovery. He soon realised the benefit and began developing the Aqua Running suit – a water buoyant aid which keeps the body upright in water, promoting proper form, and allowing the wearer to run with no impact, no stress and no further injury. The suit’s cushioning system can reduce the wearer’s weight in the water by 90% due to water being at shoulder level, allowing for increased speed, strength, agility and endurance. Through his own training methods, Nelson ran the London Marathon 15 weeks after his kidney transplant and was back running in the pool 10 days after his amputation. He also took home a gold medal as the 5000m running champion at the World Transplant Games. Word quickly spread and Nelson found himself flown out to Madrid for regular training sessions with Real players such as Cristiano Ronaldo, Gareth Bale and Luka Modric, while the owner of Manchester City was so taken with the suits that an aide appeared that evening to buy every suit that Nelson had on him. In a few short years, Aqua Running has become the byword for innovative sports training in Europe and the Middle East. Argentinian football legend Diego Maradona owns one, and bought suits for his entire extended family. Nelson saw initial interest in the US by working with the American women’s soccer team, including the likes of former captain Christie Pearce Rampone. His suits are also used at the Olympic National Medical Centre in Vail, Colorado. However, as an ex-military man himself, he was determined to bring his expertise to injured military personnel, while also finding a way of offering employment opportunities for his fellow veterans. With Aqua Running USA, Nelson will train 50 veterans throughout the United States and set them up with their own rehabilitation and fitness training business, supplying each with at least five of his Aqua Running suits in order to train injured military, athletes or differently-abled persons across the country. Michael Tatham, British Deputy Ambassador to the USA, said: “The Aqua Running suit is an exciting example of UK innovation. “It has huge potential to bring new treatments to many military veterans. It is also a great example of the UK and US working side-by-side in business and innovation. Nelson’s constant work throughout Europe means that he had to leave the day-to-day running of his American company in good hands. He said, “Who better to work with than veterans? When you have served your country – whether it be for the Army, Navy, Marines or Air Force – you learn discipline and a work ethic that is like no other.